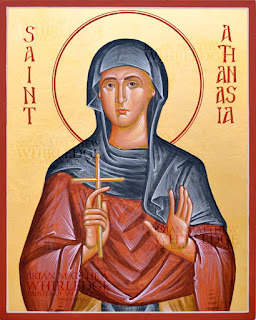 Saint Athanasia with her husband Andronicos lived in Antioch until their children died. They served the poor and sick, and eventually decided to part ways and pursue the angelic life and join separate monasteries. After years of asceticism, they individually travelled to Jerusalem, and met once again. St. Athanasia recognised her husband, but he did not recognise his wife, since she was dressed as a man. They lived together as ascetics for 12 years, until St. Athanasia died, and a written note revealed her true identity. St. Andronicus died soon after.